There is some blatant procrastinating going on right now. The America’s Next Top Model marathon is not helping. Anyway, I’ll tell you about this bread pudding instead of writing a paper! A+ student. I’m still trying to trick my body into enjoying desserts without chocolate in them. I made the peanut butter oatmeal chocolate chip cookies without chocolate chips. I’ll admit they were still delicious, and made watching Breaking Dawn Part 1 somewhat tolerable except that I wanted to feed Kristen Stewart an entire batch because I’m afraid of her skinny body and bad acting. Then Aaron tried to convince me that red velvet cake doesn’t have chocolate in it. When I informed him that yes, it has cocoa powder, he said “Well that doesn’t count as real chocolate.” Don’t tempt me. 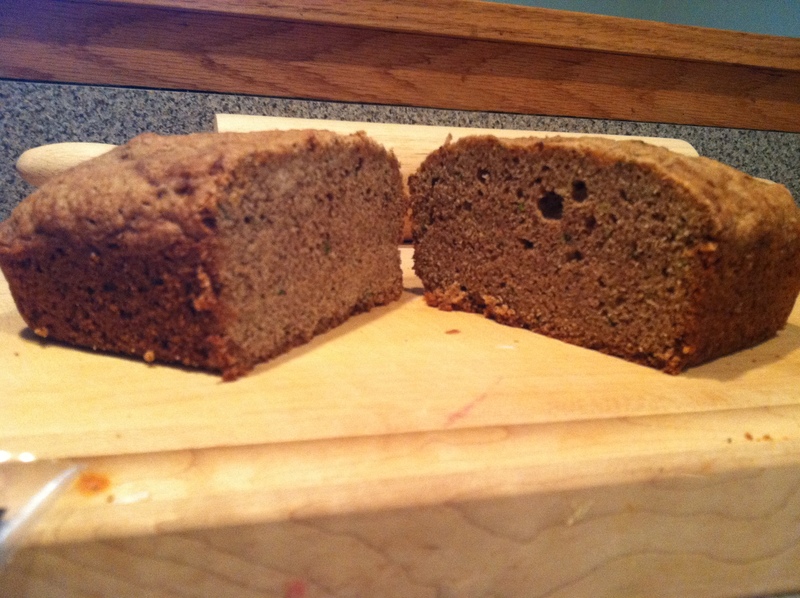 A different night I made zucchini bread from a recipe that I found on foodgawker. It was pretty mediocre. And by that I mean I inhaled three slices without breathing and then thought to myself, “I’ve had better.” So I let the remainder of the loaf sit out for a night and made bread pudding out of it the next day. Recycling at its finest. 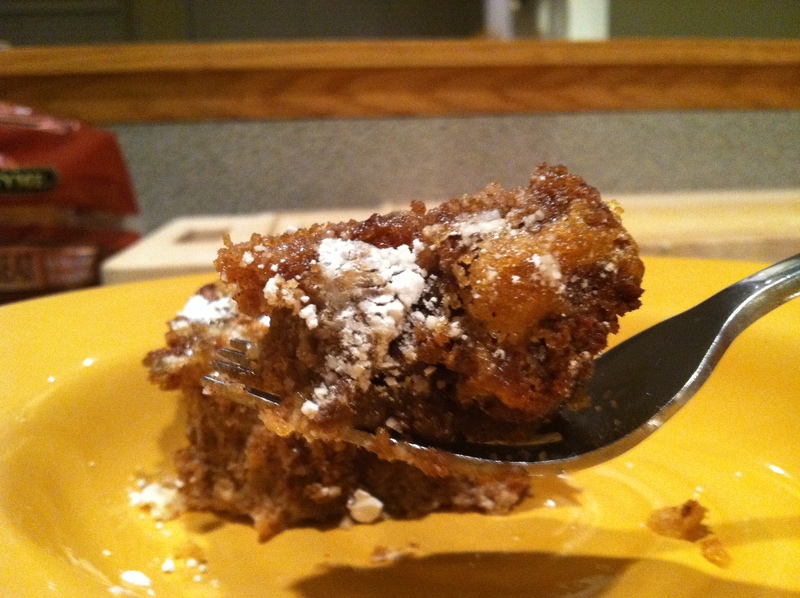 I looked up several bread pudding recipes and saw a common theme of milk or heavy cream, eggs, and spices. So this was my concoction. You could use any kind of bread you like- banana or pumpkin would be good too. Slice the bread into approximately 1 1/2 inch cubes. In a bowl, mix milk, eggs, sugar, cinnamon, and nutmeg. Pour over the bread, and push the bread around a bit to make sure everything is coated. Allow it to soak in the refrigerator for an hour or two. Most of the liquid should be absorbed. Pour into a greased dish. 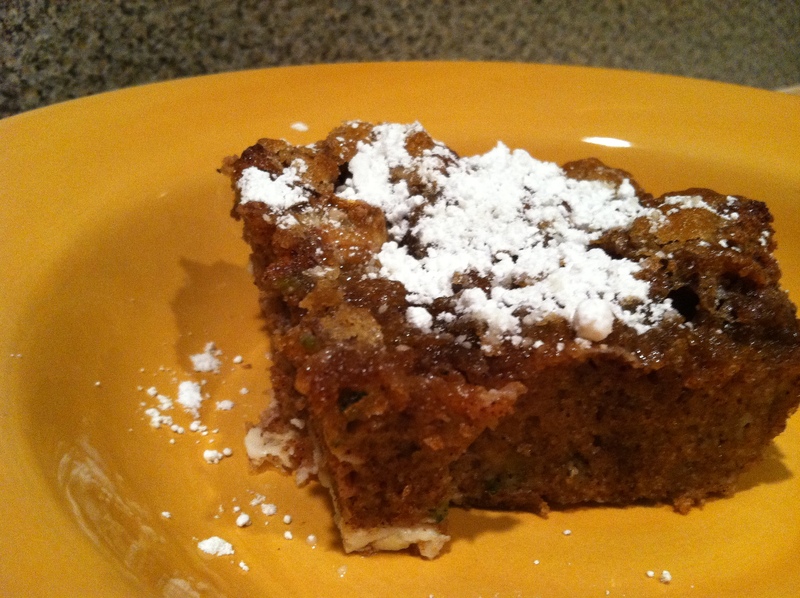 I topped mine with a mixture of butter and brown sugar which added a little sweet crunch. Place in a larger pan with about an inch or so of hot water. Bake at 350 for 50-60 minutes. Top with powdered sugar to be fancy. Yum. Just another excuse for me to eat bread.